Have you ever wished you could remotely control your MIDI-enabled automatic musical instrument, without moving from the comfort of your chair? Now you can, with this easy to use product designed and made in the USA. The Mini MIDI Sequencer+ (mMS+) is a new, tablet controlled, remote MIDI player for use with all types of MIDI-enabled musical instruments. The mMS+ reads type 0 MIDI files from an 8Gb SD Memory Card (included), sequences the MIDI information, and streams it to an external instrument by means of a standard MIDI cable. The Mini Midi Sequencer+ is controlled wirelessly via Bluetooth (range at least 9.14m / 30 feet) from an Android tablet using a custom App. 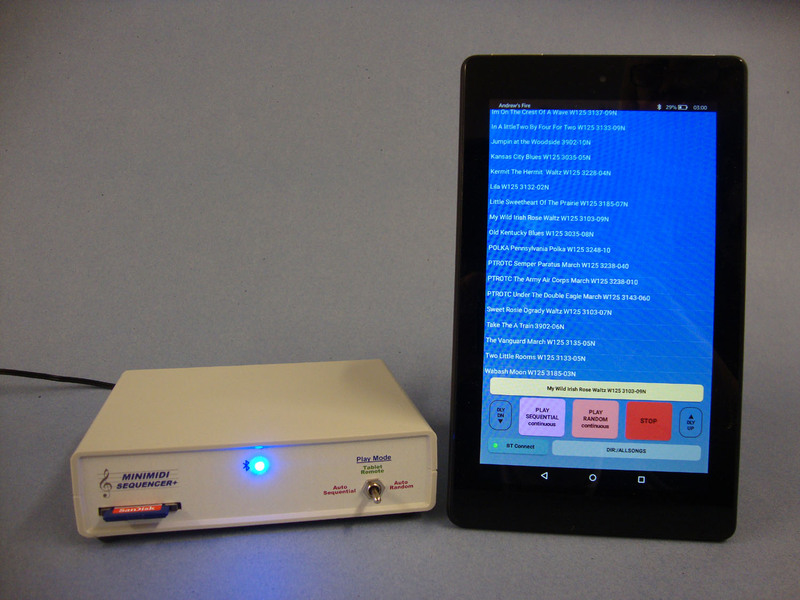 The tablet acts as a convenient remote directory and filename viewer and selector. The file and directory names are alphabetically sorted in a scrolling list. The custom App has soft keys for Play Selection, Stop, Play Sequential, Play Random, Tempo Change, and much more. It can also play music files in order from a playlist. Edit it yourself or use the simple companion MMS Playlist Editor App (included) and create a playlist using the tablet. The mMS+ device is supplied with a brand-new 7” Amazon Fire tablet (8″ available on special order), pre-installed with the Apps, together with an 8Gb SD Memory Card, a UK or European power adaptor and an inline switch. When you receive the system, all you have to do is connect the Mini MIDI Sequencer+ to the mains power supply using the switched lead and power adaptor included. On request, the adaptor can be furnished to suit either UK or continental (round pin) power sockets. Connect the MIDI lead from your instrument into the standard MIDI connector on the back of the mMS+. If your existing repertoire is already stored on an SD-Card, simply insert the card into the slot on the front side of the device. When you turn on the Amazon Fire tablet, the two devices will quickly connect with each other, and the list of tunes on the card will be displayed on the tablet’s screen. Select a title, press PLAY and you will hear music! Guarantee: You have up to 30 days to evaluate and try out the system. If it doesn’t meet your requirements you can return it for a full refund. Products must be returned in like-new condition. Contact us first for a return authorization. Customer pays for tracked and insured return shipping. Upon receipt, a refund will be provided, less the original shipping charges. Product Warranty: Guaranteed free from defects in materials and workmanship for a period of 90 days from date of purchase. If a problem arises, contact us first to see if this can be resolved. If the product needs to be returned for repair, contact us for a return number. Customer pays for tracked and insured shipping one way. A C Pilmer Automatic Music Ltd. does not warrant the tablet, which is warranted separately by Amazon. Any tablet warranty or operating problems must be resolved through the manufacturer directly. The tablet cannot be returned if it has been registered in an end user Amazon account. Pre and Post Command and delay: Can be used to trigger an event (e.g. to power on a blower) before a MIDI file or file group begins playing, and then trigger another event after play ends and after a re-triggerable delay time. Rename Bluetooth: For multiple instrument installations; link to the name of your instrument, other than the default. External Switch Play: Use an external switch (such as a coin trip or key fob RF relay) to start the music. Set it from 1 to 8 trips (coins) per play; keeps count of coin trips even while playing. We are proud to have been appointed sole distributors for the UK and Europe for these products which have been exclusively developed and manufactured by Brotech Electronics in the USA. The mini MIDI Sequencer+ is £425 (including UK delivery and VAT). Before you buy through PayPal, please contact us if you wish to check compatibility or ask any questions about the product. If you wish to order and pay with direct bank transfer, we can offer the unit at £410 (including UK delivery and VAT), so please contact us.